Walk through Point Hudson Marina in Port Townsend to see beautifully crafted wooden vessels of every type, from kayaks to three masted ships! This is the 36th annual festival celebrating the tradition of wooden boat building on the Olympic Peninsula. Come to downtown Port Townsend and Point Hudson Marina to see the beautiful boats, learn, sail and buy. More than 300 wooden boats will be on display. There will also be many opportunities to learn through hundreds of presentations and demonstrations offered throughout the weekend. The bustling crowds, fun activities for the kids, exciting races and live music add to the festive atmosphere of this Port Townsend maritime heritage celebration. For more information and to buy tickets online, visit WoodenBoat.org/festival. The magic of cinema returns to downtown Port Townsend, WA with the 13th Annual Port Townsend Film Festival this September. This beloved Pacific Northwest film festival fills Port Townsend’s streets with movie lovers of all ages and tastes. It’s a wonderful block party with the added excitement of a surprise celebrity guest every year. In addition to enjoying great films, there will be informative discussion panels and talks with filmmakers, actors and writers. Watch classic movies as well as exciting premiers of new films at different movie venues in town and on the giant screen set up in the middle of downtown. This year’s outer space theme is behind the new addition to the 2012 PT Film Fest: the Area 51 Cocktail Lounge. Area 51 at 607 Water Street will keep you “refreshed” throughout the weekend. See the full schedule of events at PTfilmfest.com. Tickets can also be purchased online or at the venues listed on the website. 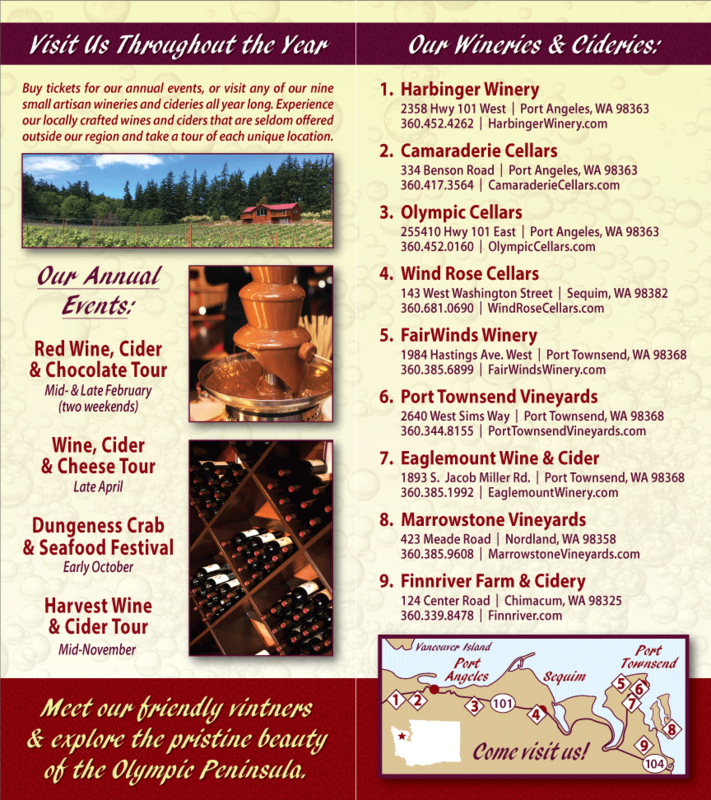 Choose local wines and ciders made by the wineries of the Olympic Peninsula during these great events! Many of the fine cafes and restaurants in Port Townsend, WA serve Olympic Peninsula wines. On your way to and from Port Townsend, stop by our Olympic Peninsula wineries. You can also take a break from the crowds and visit the local Olympic Peninsula tasting rooms.